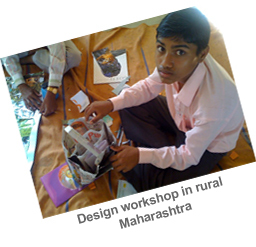 A 4 day design workshop in Khandala village as attempt to teach ‘bottom of pyramid’ 11th and 12th graders from a market and skills perspective. Confirmed that creativity exists there as much as in 'urban experts' and that rural youngsters are best suited to design for their setting. We just need to provide the tools. 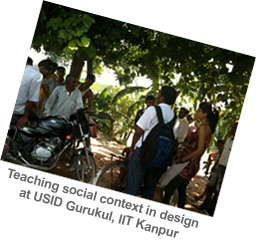 A 15 day immersive Gurukul type mentoring, to design solutions for community/system problems that would enable social upliftment and enhance quality of life. Explored education, health & care, transport & traffic, inclusive design, agriculture & food shortage, public policies and their impact etc.. Thereafter developed a system for enhanced voting experience among youth. 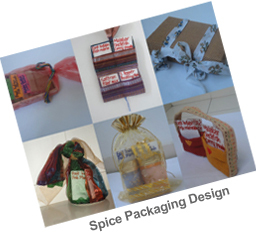 6 distinct designs to package spices, created for Ubuntu at Work. Designed so it can be made by women micro entrepreneurs of India, South Africa and Namibia as they explore new business opportunities in order to escape poverty. Designed also for appeal to the global customer. 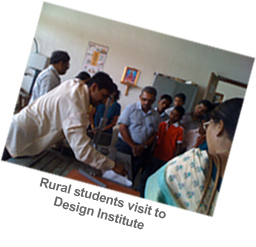 A group of students from the rural school visited MIT Institute of Design, Pune to get an exposure to the the field of Design and a Design program. They also visited IUCAA, Inter University Center for Astronomy and Astrophysics, where Dr. Arvind Gupta demonstrated his creative brilliance to them through a demo of toys from waste that he creates, that teach children Physics concepts. 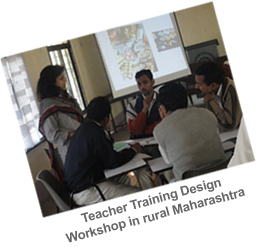 A 2 day design workshop in Khandala village with 25 teachers, with the intent of creating design awareness as well as understanding teacher’s perspectives on including design thinking in students’ learning.